Bend it, shape it, any way you want it. Wireless speaker guru Sonos has announced its latest bit of hardware: a wireless subwoofer called the Sonos Sub. The Sonos Sub has been designed from the inside out, taking in two force-cancelling speakers positioned face to face to avoid cabinet buzz, dual acoustic ports and two Class-D digital amplifiers specially tuned for the hardware. With digital sound processing (DSP) promising "zero-loss audio quality and energy", Sonos says "you won't just hear the difference Sub makes – you'll feel it with every bone in your body". 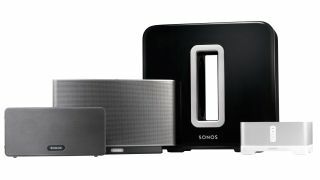 The Sonos Sub promises to give some extra grunt to the existing wireless Sonos hardware – it plays nice with all amplified components (Connect Amp, ZonePlayers 120 and 100, the Play:5 and the Play:3). What's more, you can sit it up, lie it down or stick it under the sofa and Sonos says you won't hear any loss in sound or performance. Setting it up is a one-button affair, although there'll likely be some fiddling around with the Sonos Controller apps to tweak it to your desired settings. We'll have to take Sonos' word for it when it comes to sound quality but we can vouch for the design – compared to the rest of the Sonos line-up, it's a giant. But not one we'd mind having in our living rooms, to be honest. Unfortunately, it doesn't come cheap: the black lacquer finish Sonos Sub will be available from June 15 for £599 ($699 in the US). If a matte black would suit your décor better then there's a bit more of a wait until October 2012, priced at £499 (September in the US, priced at $599).